Each year liberal/progressive Americans for Democratic Action (ADA) publishes an analysis of the voting records of members of Congress for the previous year. ADA scores Congressmen and Senators based upon the percentage of time they voted in favor of the ADA liberal/progressive position on major pieces of legislation. ADA’s voting record scores represent a measure of the extent of ideological division in Congress. This year’s ADA Scorecard shows how divided the parties are ideologically with the Republican Party becoming more Conservative. The following chart vividly illustrates why it is so difficult to get anything done in Congress. Since 1980, the ideological division between the two parties in Congress has become much more pronounced making it increasingly difficult for members of Congress to find common ground on major issues. What is surprising about ADA chart is that the ideologically division in Congress is not reflected among American voters. 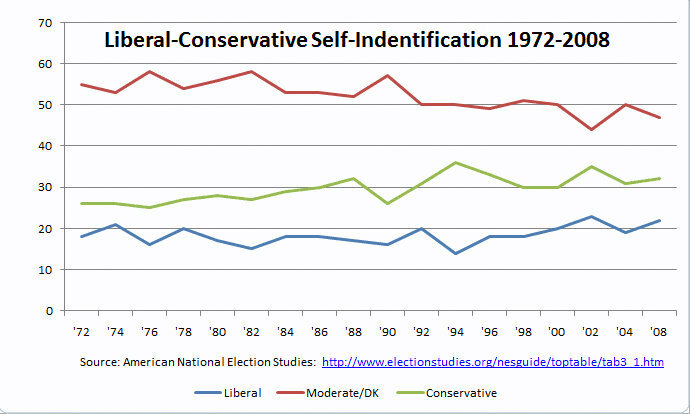 As this chart below shows, the percentage of Americans voters self-identifying as liberal or conservative has changed very little since the 1970s. 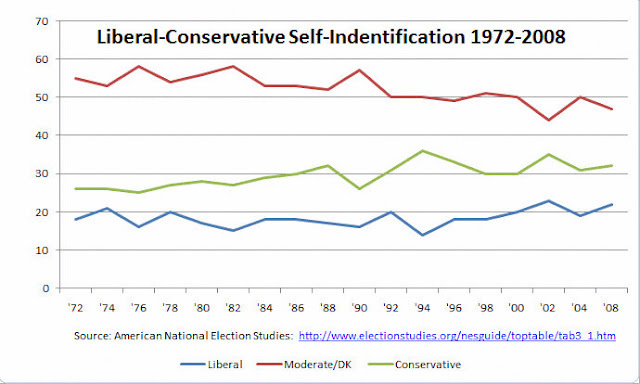 Most Americans say they are moderates or don’t know/really haven’t given much about a political ideology. We have a divided Congress but not nearly as divided nation.